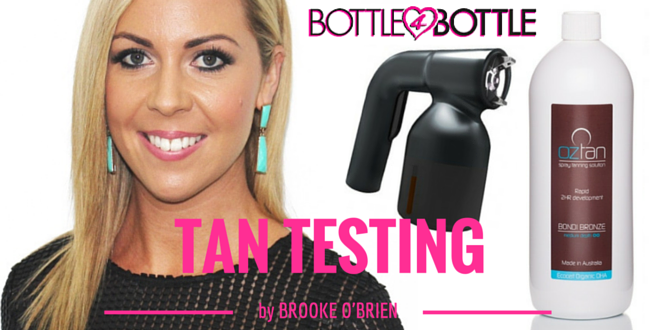 TAN TEST by Brooke O’Brien – Oztan Bondi Bronze | [All Things Tanning] For Tan Fans! Trying Oztan’s Bondi Bronze Spray Tan for the first time impressed me. The solution come out of my spray tan gun in a fine mist giving a flawless even application. The colour guide is beautiful and light which left Laura feeling comfortable to get on with daily duties without feeling unusually dark. Oztan’s Bondi Bronze is made out of natural botanical ingredients and had a neutral smell, NO spray tan odour. “Bondi Bronze” is popular in the Oztan’s range for it’s olive tones and medium colour results. With Laura skin being fair, the olive tones adapted very naturally giving her a beautiful summer holiday tanning result and glow. Laura left her colour guide on for 2 hours before showering off. Did I mention this product contains Vitamin E? Well this has to be a star ingredient as it really hydrated Laura’s skin the whole time she had her tan on, until it was ready to be removed. The tan lasted 9 days on Laura’s skin and faded well without going patchy. Laura gave her skin a light scrub on day 10 and any last remaining tan came off with ease ready for a new application.